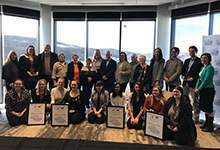 Today, over 100 volunteers attended a Volunteer Week reception at the Signal Hill Campus of Memorial University, an annual event hosted by the City of St. John’s in partnership with the Memorial University Student Volunteer Bureau. The volunteer award breakfast was emceed by Deputy Mayor Sheilagh O’Leary and Taylor Ivany, Coordinator of Memorial University Student Volunteer Bureau, and the guest speaker was Raylene Mackey, Honourary Co-Chair of Provincial Volunteer Week. The Building Healthy Communities award is presented annually to individuals and/or groups in St. John’s who are helping to create vibrant communities and enhance the quality of life for citizens through delivering leisure programs and services. Information about the winners are in the attached backgrounder.